With only 2 weeks left of 2014, Pipette.com announces a limited time special on Sartorius Biohit products. The product specials include Buy 1 get 1 Free on mLINE pipettes, Picus Electronic Pipette Trade-in Program, and free pipette tips. For those wanting a lightweight and small electronic pipette, the Sartorius Biohit Picus is the ideal choice. It is the smallest and lightest electronic pipette on the market. The Picus Trade-in Program allows customers to trade-in their pipette towards the purchase of a new Sartorius Biohit Picus electronic pipette. The special also includes free pipette tips with select pipette purchases of the following: Sartorius Biohit Picus, Sartorius eLINE, 3 Sartorius Proline Plus, or 3 mLINE pipettes. Lab purchasers wanting to acquire high-quality pipettes for a great price should take advantage of this limited time offer – offer ends December 31, 2014. To learn more about the Sartorius Biohit Year-End Specials, visit http://pipette.com/biohitpipettes. Pipette.com is a major liquid handling distribution company with 18 years of experience. Their portfolio includes 20+ brands of pipettes, 10+ brands of pipette tips, lab equipment, and ISO 17025 pipette calibration service. 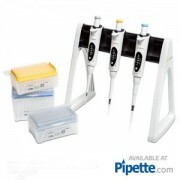 Pipette.com is dedicated to finding catered solutions for the life science community.